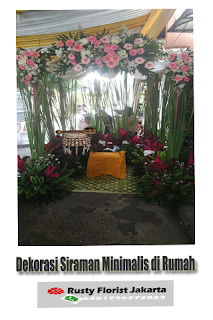 Siraman decoration are mostly using gazebo and ‘gebyok’ with mats decorated with flowers in making a luxurious atmosphere by maintaining elements of traditional rituals. The whole fully flower decoration shall be seen from all side position to make it easier for brides and the grooms to see the freshness of flowers and to see them from other perspectives. Siraman decoration can be done at home with jasmine flowers, white orchids, tuberose sedap malam flowers beautifully arranged. Decoration with a mini garden model design by utilizing the existing garden with ornamental plants in the house of the bride and grooms then transformed them into a flower garden, and to maximize the decoration can add with bird cages for displaying purpose that has been decorated with flowers, and making balls shaped flowers to enhance the booth table display, following with a combination of batik cloth for the seat chair in creating contrast effect shiny bright with the green mats of "tikar pandan" and jasmine flower petals around it to display a traditional and atmosphere of freshness and aroma . Washing equipment that adorns the atmosphere consists of water with flower petals whereas the basin is also decorated with jasmine flower – along with decorated jug itself. By making additional decoration enhancement such as standing flowers and any beautiful creation of fresh flowers. Again, decoration for the gazebo as example; can be done more beautiful by adding accessories such as colored cloths at gazebo to create effect colors of the beauty of each material of cloth and flowers at gazebo. E-mail address : #Order Decoration@RustyFlorist . 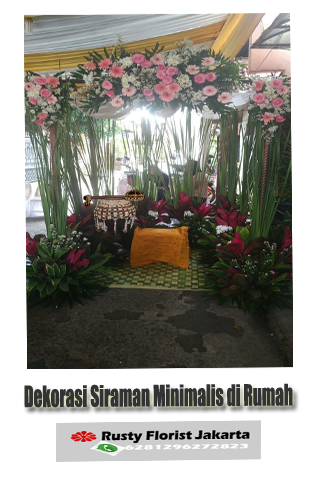 We provide you with all flower decoration's needs and its decoration properties that supported siraman decoration. 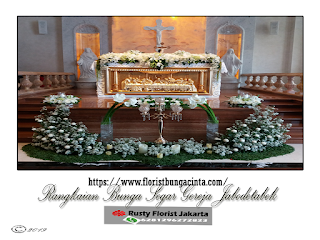 Our decoration service would be available all around Jabodetabek area.